A number of people e-mailed me asking about Machu Picchu trail, so I have decided to write a page on it. Actually there is no Machu Picchu trail, the trail which will take you to Machu Picchu is known as Inca trail, not Machu Picchu trail, but you can say it as Machu Picchu trail since this trail will take you to Machu Picchu. There is another trail which will take you to Machu Picchu - Salkantay trail. Regular Inca trail is also known as classic Inca trail, or Camino Inca or Camino Inka is very popular among the trekkers. It has become so crowded that Peruvian Government has issued a rule which restricts the total number of people that can enter the trail each day to 500. So if you are interested to use the trail you have to book an operator well in advance. Some cases people thinks that the one day visit to Machu Picchu from Cusco	by	train (Hiram Bingham express, Vistadome or Backpackers.) is the Machu Picchu Trail, or the ascends from	Aguas Calientes to Machu Picchu on foot ( one hour journey) is Machu Picchu trail. Actually they are wrongly mentioned as Machu Picchu trail sometimes, actually there is no Machu Picchu trail, if you are looking for trail to reach Machu Picchu it is actually Inca trail you are looking for. Roads built by Inca were most extensive among the roads and trails constructed during Pre-Columbian South America. There were mainly two roads, eastern and western routes. Eastern route connects Quito, Ecuador and Mendoza, Argentina and pass through Puno, Peru. Western route pass through the coastal belt. There were more than 20 other shorter routes pass through the western mountains, some were as high as 15000 ft above sea level. Inca road system is altogether 40,000 km in length, if added all the routes. Regular Inca Trail, two days	short Inca Trail	and	Salkantay Trail	will take you to Machu Picchu. Regular Inca trail or classic trail is the most popular one. Classic Inca trail starts from a place known as KM82. 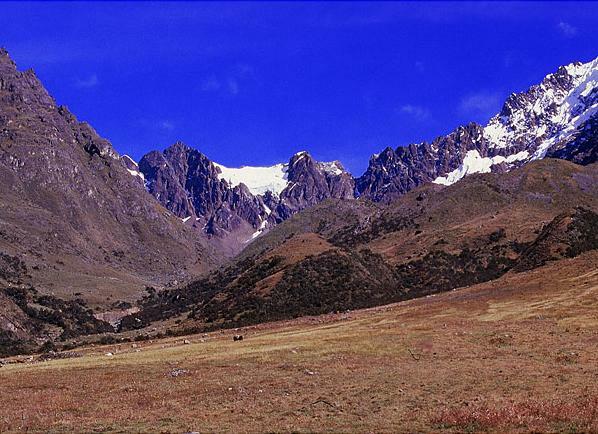 KM82 is the popular place to start classic Inca trail. This place is 82 km distance from Cusco city towards Machu Picchu along rail line. The total distance between Cusco and Machu Picchu is 112 km along the railway line. Once you start you have to walk another 45 km to reach Machu Picchu. This trail is for 4 days. On the first day you will start from Cusco to KM82, then walk a little. Next two days you will advance most part of the trail. Last day you will reach Machu Picchu. On this day you will roam around Machu Picchu and finally on the forth evening you will take the train form Aguas Calientes ( a city few miles from Machu Picchu) to Cusco. If you don't want to walk much you can take the short Inca trail. It is only around 8 km walk towards Machu Picchu. This trek is for only two days. First day you will be taken to close to Machu Picchu by train, then you will walk. Next day you will walk more and reach Machu Picchu, look around and come back to Cusco by train. to book this trail few months in advance. This trail merges with Inca trail at at Wayllabamba. But if you don't have much time and you are still interested to hike and reach Machu Picchu take the route, which is Mollepata- Salkantay - Santa Teresa - Machu Picchu. Incas developed a system of accounting, Quipu, where from a series of chords and with knots of different color and various thickness, they kept exact records of different transactions.